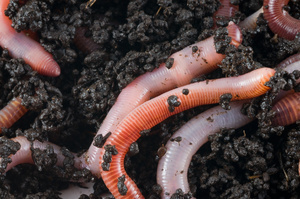 Carl Meeks pulled a nightcrawler from the peat in a Styrofoam box, then pinched the worm in two pieces. He tossed the bottom section of the nightcrawler in the North Fork River before threading a 1 1/2-inch piece on his hook. He calls this a nightcrawler stub. "See, there's nothing to this trout fishing," Meeks laughed. "All you've got to do is tear your worm in two." He had just caught his third rainbow trout on the same 1 1/2-inch nightcrawler stub. "I like the durability of nightcrawlers," Meeks said. "They withstand a lot of abuse, and Norfork has got a lot of obstacles in it." Meeks was born in Illinois in 1941 and grew up there. In 1971 he came to visit a friend who had bought a home in Cotter, Arkansas. Meeks liked the area so much he moved to Cotter, too. He quickly became part of the trout fishing scene, starting out as a cook on camp trips, then guiding.There are far more anglers on the White and North Fork rivers now than there were in the 1970s, but there aren't as many overnight camp trips today as there were then. "In the old days, there was a lot of camaraderie on those camp trips," Meeks said. "There were a bunch of us that worked a lot of days together." Meeks' marriage even has a fishing guide connection. His wife, Connie, is Elvin Weaver's sister. Weaver has built a reputation as one of the best guides for catching big trout on the White River. Carl and Connie's house stands on a hill that overlooks the Miller Hole of the White River below Cotter. Through a telescope in his den, Carl can look at a particular rock in the Miller Hole and gauge the river flow.If you're a trout fishing guide in this area, you're going to spend many days on the Norfork Tailwater, too. Meeks enjoys the change of pace in moving back and forth between the White and North Fork rivers.And the Norfork Tailwater brings back some pleasant memories, including a pair of 12-pound rainbow trout caught in Mill Dam Eddy. One hit a red worm during high-water conditions. The other was caught on a sculpin in low water.Meeks has been around long enough to witness the decline in the numbers of big rainbow trout. "At one time, it wasn't uncommon to catch a cooler full of rainbows weighing from three to eight pounds," Meeks said. "There were a lot in the three- to five-pound class." There is probably 10 to 15 times the fishing pressure on these rivers now than there was then. That's just a guess. There are more outfitters, more fishermen, and the fishermen are more efficient. "Although Meeks fishes with jigs and artificial lures, like Rapalas, at times, he is mainly a bait fisherman. Overall, he prefers red worms, crawfish tails and nightcrawlers, in that order. Nightcrawlers often get the nod on Norfork, as mentioned before, because of their durability. "I don't like corn, and I don't like Power Bait," Meeks said. "You catch too many stockers. "One reason Meeks likes the Norfork Tailwater is the quality of the rainbow trout here. Although the Norfork National Fish Hatchery is nearby, providing plenty of 9-inch rainbow trout "stockers," it seems there are always good numbers of "holdover" rainbows here. These fish have been in the river long enough to gain some size and some brilliance in the crimson stripe down their sides.As do most bait fishermen in this area, Meeks usually relies on spinning gear, a drift rig and 4-pound-test line. The drift rig is made from a 30- to 36inch section of line that has a hook tied to one end and a bell sinker on the other. It is attached to the main line about eight inches above the bell sinker, so the sinker looks like it's on a dropper.Meeks prefers a No. 10 sinker, "the smallest there is," and a No. 6 hook. "You can use a No. 4 hook, but it catches a lot more moss," he said. Boat control is the key to fishing a drift rig. On this day, both generators were running at Norfork Dam. Meeks often uses a drag chain for boat control in the White River, but drag chains are banned in the North Fork. Here Meeks uses his outboard motor, keeping it idling and shifting in and out of gear, to both hold the boat parallel to the bank and slow its drift downstream. The drift rig is cast toward the bank. "I want my line either along side me or slightly upstream," Meeks said. "If the line gets too far behind you downstream, then you are dragging, not drifting. "Water flows slower near the bottom of the stream because it is obstructed by objects in the stream bed - rock ledges, boulders, moss beds, etc. Typically, trout will face upstream behind these objects, out of the swift current. They will make short darts into the current to pick off food drifting by. Therefore, it is impossible to get the bait on the bottom and keep it drifting the same speed as the current there. The line acts as a gauge, telling you when to slow down or speed up the boat. "Put your boat in the faster water and fish in the slower water," Meeks said. "That allows you to use the motor. For instance, if you want to fish the middle of the stream, put the boat on the outside edge of the current and cast toward the inside edge." If there is no water coming from the dam, Meeks will stick with nightcrawlers, especially if he is after a big brown trout, but he changes tactics. Instead of only a part of one nightcrawler, Meeks puts two whole nightcrawlers on a No. 6 hook. "Thread one on, bring the hook halfway down it and slide the night crawler up the line," Meeks said. "Thread another one on halfway and let the tail dangle. "The result is two dangling tails and a hook completely covered in night crawlers.From an anchored boat, this is cast downstream on the same bell sinker rig used for drift fishing. In August 1994, the Arkansas Game and Fish Commission approved a catch-and-release, artificial-lure-only zone on the Norfork Tailwater from Otter Creek to 100 yards above River Ridge Access, effective January 1,1995. That area includes Mill Dam Eddy, where Meeks caught the two 12-pound rainbows on bait. In the future, he'll fish that area with jigs, especially when power generation in less than two generators. "You want to fish a jig as slow as you can fish it," Meeks said. "Work over moss beds, behind logs, around any of the obstructions where big rainbows tend to lay and wait for food. "I usually hold the rod tip at about two o'clock and give it a little twitch You want to fish slow, but vary the retrieve." Meeks uses 1/16th- and 1/32nd- ounce jigs in olive, brown or brown-and-orange color patterns. Sometimes the trout seem to prefer something with a smaller profile. Meeks wets a jig, then trims the marabou just past the hook bend. "I like to use jigs when one generator is running and the water is clear,' Meeks said. "It's more of a sight-fishing method. You'll see most of the fish take the jig, and that's the hard part - waiting to set the hook. "If the second generator comes on, you're not done, but there are fewer places to fish a jig. It's tougher to get it down where it needs to be. They won't come up four feet to hit it. You can only raise a fish about 18 inches. When the water gets that high, I'd rather put on a Rapala or drift bait. Then, as Meeks says, the trout fishing becomes as simple as tearing your worm in two.